Tom Knox has conceded over at the Loews. Michael Nutter is your next likely mayor. Maybe it's just the time I got here, but Nutter HQ is blowing up. Nutter has a 17,000 vote lead over Knox with 77 percent reporting and his campaign party shows it. It's not over yet, but the people partying here say they think it might be. Nutter 'surging' ahead; West Philly not all in yet? 67 percent of votes are counted, Nutter has 68,000 votes and Knox 54,000. Bob Brady (34k) and Chaka Fattah (25k) follow. Saint Joseph's professor Randall Miller checks in with some off the hip analysis. 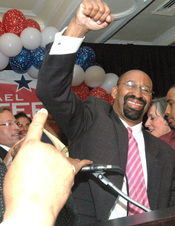 He sees Nutter surging, but tempers that with the fact that it doesn't look like many West Philly (read: Jannie Blackwell) divisions have reported. "It ain't over, but as of right now it looks like basically a two-person race with Brady being something of a spoiler in some places," Miller says. "If he spoils anyone it's Knox." About 150 people meandering around, band playing at Sheraton ballroom. People milling around in the veranda. Pretty mellow, except for the band playing loudly for the five people watching. Folks here at the Marriott aren't letting the polls bring them down - well, not enough to keep them from laughing and enjoying themselves anyway. Evans is trailing badly, hovering around 5 percent, a little more than 1999. He was a candidate with plenty of ideas, but none that engaged voters citywide. Dwight Evans: Out. Big ceiling, wine (red and white), cheese, crackers, fruit. TV guys set up on rafters, stage set up for Knox. About 30 cocktail tables. waiting. 28-28 Knox and Nutter tied at this moment. Brady 22, Fattah 17, Evans 5. 14 percent reporting. 6ABC is tracking the results live. With 1 percent of precints reporting, Bob Brady leads with 29 percent. It's over. Brady wins. Keep checking back. Thanks, 6ABC. My watch says 8 p.m. Primary Day 2007 is over, my friends. Any voter in line before the deadline will be allowed to vote, and then the counting begins. We could have our likely next mayor before midnight. Or, as AP let us know just a bit ago, if the race is too close to call around 12:30 a.m. the counting operation will cease and they'll be counting the provisional and absentee ballots for the next week. We're hoping it's over by midnight. Eleven would be even better. Call it by 10 and we'll bow down and kiss your feet. Stay tuned to the FFR215 for updates throughout the night as we station reporters at many of the campaign's parties and, more importantly, at the election bureau where the final results are coming in. Your Metro/FFR215 team includes: Josh Cornfield, Brian X. McCrone and Mike Benner traveling around to different parties, while Rikard Larma, Cody Glenn and Andre Pascoe point and shoot their cameras. Tom Rice mans the election bureau, while editors Ron Varrial, Stephanie Hinderer and Adam Levitan eat pizza in the office watch over the operation from Metro HQ. It's been an exciting four months; now get ready for the final four hours. All of those in line by 8 p.m. will be allowed to cast their votes, but then they cut you off. At least they're supposed to. If you haven't voted yet, get on it. If you don't, you lose the right to complain about city government for what most likely will be two terms of the next administration. And, seriously, we know you all want to complain. Special thanks to Metro/Fight for Room 215 intern Andre Pascoe for all of his fine photography work on the site today. It all comes down to today for the five campaigns and now it all comes down to these last two and a half hours. One last push for all of the campaigns to get out the vote. Then the parties begin at downtown hotels and a South Philly union hall. 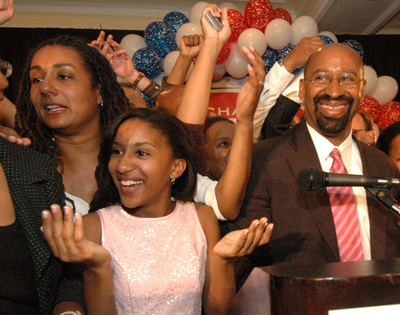 The 2007 mayoral primary will be over soon. A polling place at a bar. Damn, we wish our polling place was in a bar. 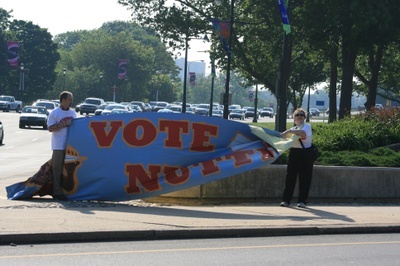 A hand-painted sign supporting Michael Nutter held by two supporters wishing they had more Michael Nutter supporters with them holding the sign as it blew in the wind. 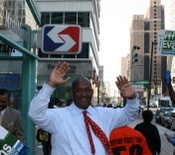 Dwight Evans giving it one more shot to draw some voters, standing at the elevator heading into the bowels of the City Hall SEPTA concourse, just hoping that a handful of those whose hand he shook would go home and vote for him. Let us know what you see at your polling place and whatever else is happening out there today. Rumors are fine, but, please, no outright lies and nothing libelous. Metro endorses none of the content of these comments, but we'll look into anything that looks fun. This is very serious. Police now confirm that two men, who were -- in a horrific touch -- wearing "Knox for Mayor" t-shirts -- entered a Knox satellite campaign office at about 12:56 p.m. and pulled a gun on a campaign staffer there. The robbers demanded money. They got a canvas bag of money that was full of what police are calling "employee salaries" -- and I think we would call "street money" -- and left.